It was 10am on a Saturday morning. 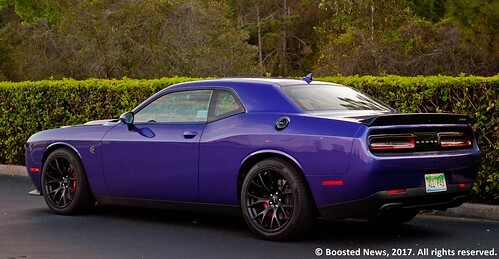 I steered my Dodge Challenger Hellcat test car toward an on-ramp entering Interstate 10 in Jacksonville, Florida, heading west toward the panhandle. Two of my friends are in the car with me, our breakfast not quite settled yet. I scrolled through the Vehicle Info display on the gauge cluster; the engine oil and transmission fluid were just reaching operating temperature. I straightened the steering wheel and hesitated for a second. My front passenger noticed and looked up from her tablet, and then over at me, and saw the look on my face. She quickly put the tablet down and reached for the grab handle on the door. She’s been in plenty of cars with me before. She knew what was happening. The traction control light started flashing. 275-series tires are considered pretty wide for most applications, but they’re entirely too narrow for this one. They’re no match for the Hellcat’s power. They finally got full traction in 3rd gear. Both my passengers’ pleas for me to slow down were rapidly increasing in volume and intensity. They were getting genuinely scared. I was already going way faster than I’ll admit publicly. I merged onto I-10, and while most cars have to continue accelerating to match the speed of traffic at the end of an on-ramp, I was having to brake. Keeping my foot on the throttle at that point would be as good as calling the local news station and telling them to show up at my exact location with a cameraman in a helicopter. Even in Eco mode, even with more horsepower than the average entry-level midsize family sedan makes taken away from it, the Hellcat makes 500hp, enough to flip pancakes after they were already in my passengers’ stomachs. But you don’t give a damn about the Hellcat’s Eco mode. It’s the best definition of the term “muscle car” currently available, so it makes its horsepower the old-fashioned way. The engine displaces 6.2L. There are only 2 valves per cylinder, and they’re actuated by pushrods off of a single camshaft in the engine block. There is no variable valve timing or direct fuel injection or any of that newfangled high-falutin’ crap. 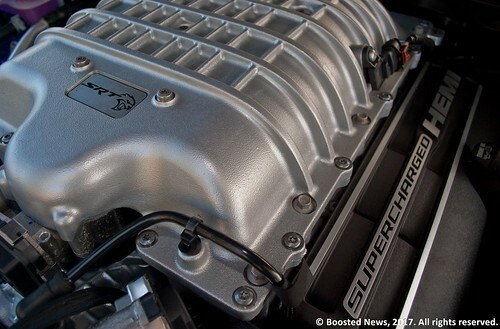 There’s just a comically large supercharger sitting atop the engine, itself displacing as much as the entire engine of an entry-level midsize family sedan at 2.4L, and the compression ratio is still 9.5:1 despite it. It has twin air-to-water intercoolers with six heat exchangers and a dedicated electric water pump separate from the engine’s primary mechanical water pump. The engine needs so much air that the front grills aren’t enough; the driver’s side inner halo light is hollow and channels air straight into the airbox. 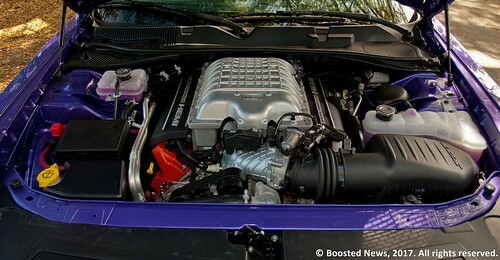 The net result in any mode other than Eco mode is 707hp and 650 ft-lbs of torque. Seven hundred and seven horsepower. Six hundred and fifty foot-pounds of torque. If that isn’t eye-opening enough, it’s all sent to only the rear wheels. There is an asymmetrical limited-slip differential back there big enough to put a prize-winning watermelon to shame. But that, traction control, and your prudence are the only things keeping 707hp and 650 ft-lbs of torque under control. That makes getting consistent acceleration times difficult. 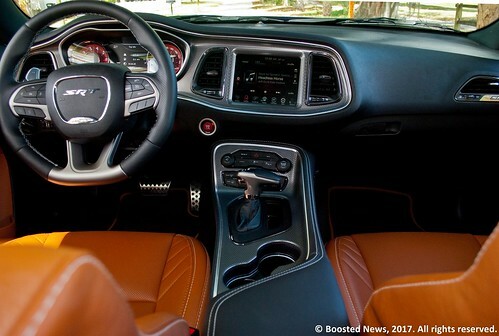 The SRT button next to the HVAC controls will make the entire 7-inch display a racing data center, and in a Hellcat with the 8-speed TorqueFlite automatic, like my tester, you can choose your launch RPM. My best acceleration time was 0-60 in 4.5 seconds with a 12.2 second quarter mile and a 126mph trap speed, with a launch RPM of 1750rpm. The higher the RPMs I tried to use for the launch, the slower the times were, simply because of the Hellcat’s fetish for creating tire smoke. 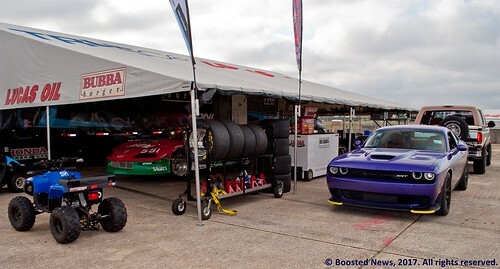 Other publications have gotten faster times from their Hellcats, but my relatively slow 0-60 time compared to my quarter mile time and trap speed show just how fast the Hellcat could be with more rubber on the road, an issue that no doubt influenced FCA’s recent decision to add a widebody Hellcat to the lineup. Regardless, a quarter mile in 12.2 seconds at 126mph is breakfast-ruiningly fast. 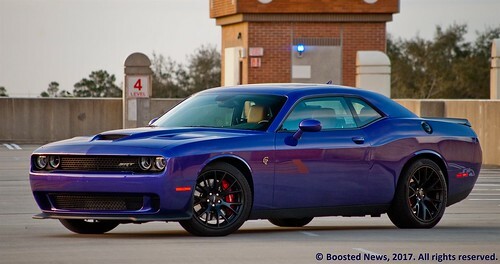 The Hellcat is also the textbook definition of a muscle car in another sense as well: it’s a one-trick pony. Or feline, whatever. In SRT mode, the driver can set the adjustable Bilstein shock absorbers to the track setting, which makes the ride firm to the point of bounciness on the street. Plus, the brakes are gargantuan six-piston front calipers and four-piston rear calipers made by Brembo, clamping down on 15.4-inch 2-piece slotted rotors in the front and 13.8-inch slotted rotors in the back. The lateral acceleration of 1.0g would also suggest that the Hellcat can actually work as a sports car and not just a muscle car. But, there’s no denying the cold, hard truth: the Challenger Hellcat automatic curb weight is nearly two and a quarter tons. It can’t be caressed through a hairpin turn on a racetrack or down a coastal highway awash in romantic sunset colors. It’s a stable car; it can take corners without being tricky or nervous. But it just feels out of its bailiwick doing it. It’d be like asking a football player to do parkour. Hang on a second, though, because saying the Hellcat has one purpose and one purpose alone is being a bit harsh. There’s one other thing a proper muscle car will be expected to do, and that’s make its passengers look like bad-asses just cruising around. I was actually happy my test car was the automatic, as I think it better suits the car’s character. That should explain why I spent my week with it covering nearly the entire state of Florida. Before our trip to the panhandle, I drove it down to Sebring as well, as I was invited to be part of the MJK Racing pit crew as owner Mike Kern was participating in the HSR support race before the official 12 Hours of Sebring. When I got there, Mike had to walk out to the entrance to give me my ticket and my paddock parking pass, and he, a race car driver who was preparing to drive his own vintage GT-1 race car on the track at Sebring, had his window rolled down to make sure he was as conspicuous as possible as I drove through the infield in the Plum Crazy Hellcat. All eyes were on us as we passed the rows of race teams to park next to his trailer in the paddocks. 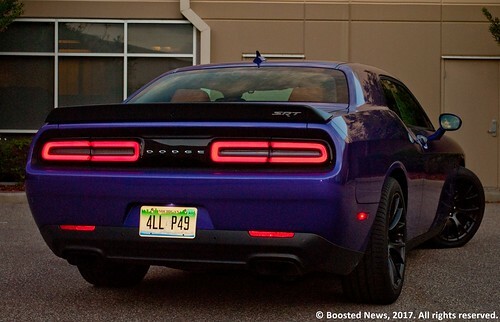 In the middle of the brouhaha of electrification, autonomous driving technology, and the strengthening involvement of the government into things like emissions and fuel economy, the Dodge Challenger Hellcat exists in stubborn defiance of every single bit of it. Dodge has proven that the gawk factor, the wanton excess, and the egotism of muscle cars has a place in the 21st century. Let’s not forget performance for the money either. A Porsche 911 Turbo, for example, starts at $161,800 and has 540hp, meaning each horsepower essentially costs $300. 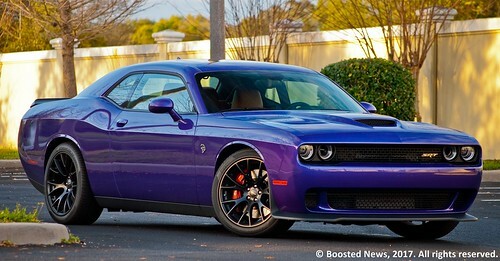 At the as-tested MSRP of $70,775 for the Challenger Hellcat, each horsepower costs exactly $100. With a 911 Turbo, you’re getting a tad more than what the Hellcat has in Eco mode, and you’re paying 3 times as much per horsepower. Oh, and motion sickness medicine. Test vehicle provided by Fiat Chrysler North America.